This is just a final missive from the Nerve Centre to tell you about some more Art and Script Droids who have confirmed their presence at Dreddcon 2002, which is being held this Saturday (14 Dec) at the Brewery in London (www.thebrewery.co.uk), and to let you know about some of the events that will be happening over the course of the day. Some of the following droids were listed in later versions of my previous announcement, but as the Earthlet brain seems to forget details such as these very easily, it can't hurt to mention them again. The confirmed list of script droids in attendance now includes Mike Carey (13/Lucifer), Peter Hogan (Strontium Dogs/Durham Red), Robbie Morrison (Nikolai Dante/The Authority) and Gordon Rennie (Necronauts/Storming Heaven), who will be endeavouring not to spill his drink on anyone's original artwork this time. 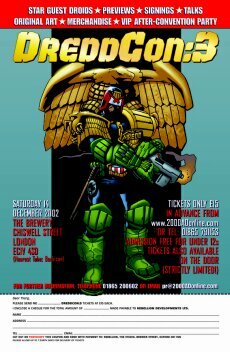 I can also now confirm that Dredd creator and regular scribe John Wagner has now confirmed that he will be attending Dreddcon. Meanwhile, the list of attending art droids has expanded most impressively, with new additions including David Bircham (Sinister Dexter/Slaine), Simon Bisley (Slaine/ABC Warriors), Laurence Campbell (Bison/DeMarco P.I. ), D'Israeli (Lazarus Churchyard/Scarlet Traces), Simon Fraser (Nikolai Dante), Kev Hopgood (Harlem Heroes/Night Zero), Paul Marshall (Dredd/Firekind/Tyranny Rex), Dom Reardon (Cabbalistics, Inc.) and Lee Townsend (Bison/Past Imperfect/Sinister Dexter). As mentioned previously, in addition to a dealer room, there will be a talks room and a room for more visual demonstrations. The talks room will host a number of events, including panels of new and established droids and discussions on the history of 2000 AD, its future, and the future of comics in general, plus anime films from Manga during quieter periods. The day will be rounded off with that perennial favourite, Tharg's Pitch Fest, where anyone attending Dreddcon has the opportunity to spend two minutes pitching an idea for a Future Shock, Terror Tale or Past Imperfect to a panel of 2000 AD editors and other creators. The person who pitches the winning idea will be asked to work it up into a full script, which will be published in a future issue of 2000 AD (please contact one of my events droids at the email addresses below if you require more details on Pitch Fest). The other room will feature a range of more practical demonstrations, including talks from Big Finish on how they script and act for the 2000 AD audio dramas, and how they go about recording sound effects and creating a believable environment in an audio medium. Art droid Frazer Irving will be giving Dreddcon attendees an insight into the his weird and wonderful artwork through the medium of a slideshow and interpretative dance (I might be misreading the last bit), and Emmy award-winning prosthetic make-up artist Steve Bettles (Sleepy Hollow/Jack & The Beanstalk), will be making someone up as a well-known 2000 AD character. There will be a number of other art-related events going on throughout the day. Day tickets for the event (£15) and full tickets for the event and the post-Dreddcon party in the evening (£25) will be available on the door from 9am. Children under 12 years of age will be allowed in to the daytime event free of charge, though there is a strict over-18s policy for the post event party. My event-organising droids can be contacted if you need any further information, on 01865 200 602/606, or by emailing markc@rebellion.co.uk or dominic@rebellion.co.uk.